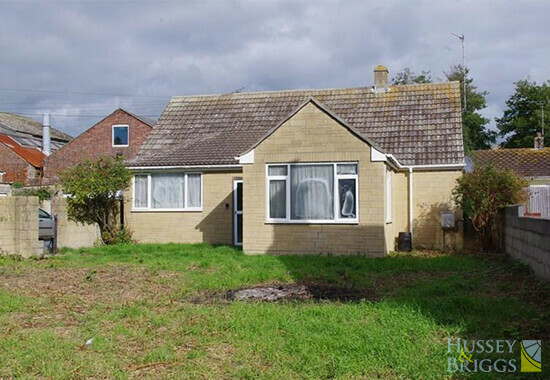 Creating extra living space by adding a modern new extension can completely change the look of your house. 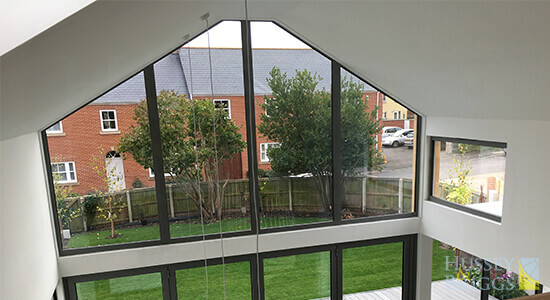 Choosing the right glazing options in these situations can really transform any building. It can turn something ordinary into something truly spectacular. When Mrs Gould was looking to completely renovate and extend her home in Bridport, she turned to one of our showrooms for inspiration. Her aim - to create a large open plan living space with a mezzanine gallery area. The design needed to look very contemporary, but it was also important that the new design would blend well with her existing 1960’s bungalow. 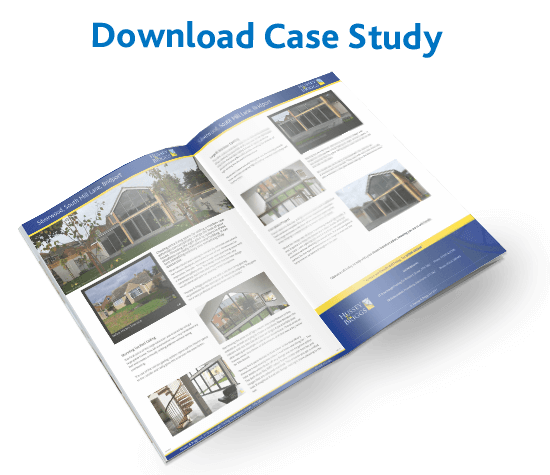 The focal point of this large extension was created by using a large gable frame. This tall construction has a very contemporary feel and creates a visually striking addition without being overbearing. 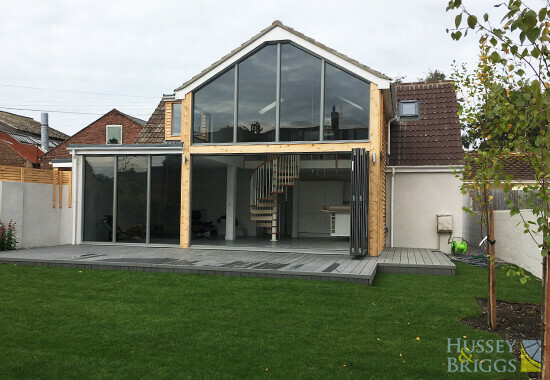 The use of the various glazing options opens up the interior space to the outside and really gives this extension the wow factor. 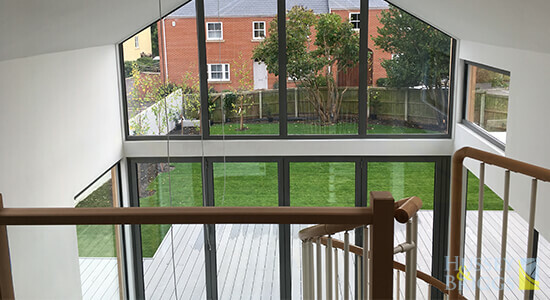 Maximising the amount of light meant was a key feature of this extension, as well as trying to create a seamless flow between the indoors and out. 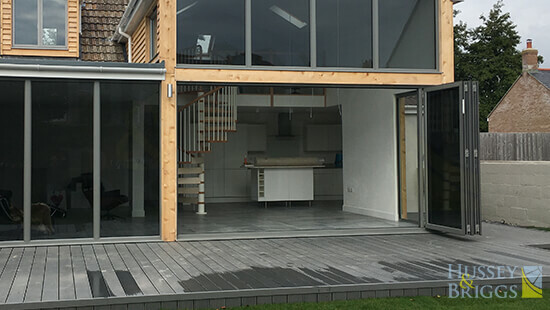 Mrs Gould chose an Origin 4 pane bi-fold door after seeing an example in one of our showrooms. The aluminium frames come in a choice of 200 colours, and that was a key factor for Mrs Gould. 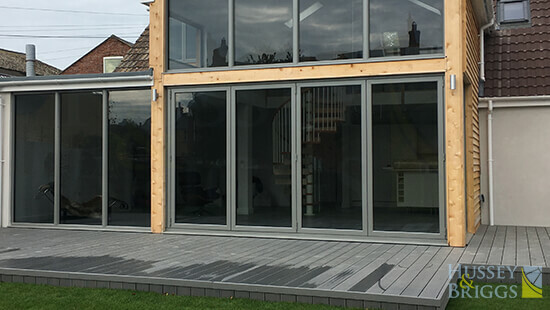 “Seeing the 5 pane Bi-fold in Dark Silver in the Poundbury showroom was exactly the colour I had been searching for”. The little details which finish off any design are not forgotten either. The dark silver RAL 9007 colour frame comes with handles and hinges that are coloured matched. This ensures you get a unified look throughout the whole design making it more pleasing to the eye. 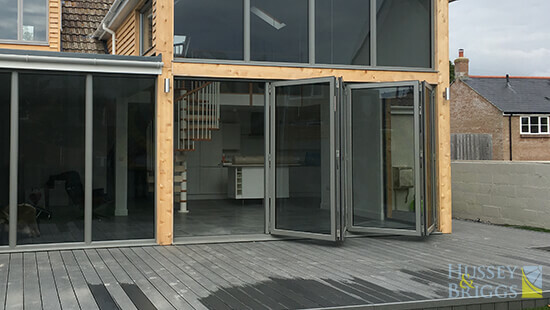 The 4.8m x 2,4m bi-fold doors make for an impressive entrance. 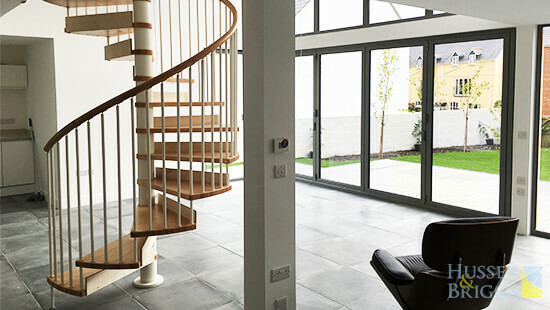 When opening the doors fold all the way over to the right-hand side (from the outside) making full use of space; while the aluminium frame offers a slim profile meaning the amount of light coming into the room is maximised. 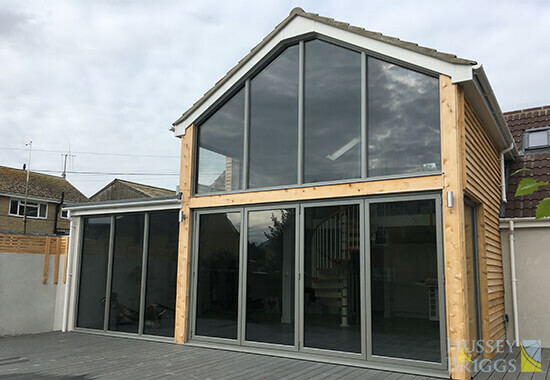 Aluminium frames not only look good, but the coating protects them corrosion while the high durability material means they will last for years. Glazing was an important element to the internal design and helped to continue the overall feeling of a light and airy space. It was essential that the glass railing system was functional but did not look out pf place. French doors to the rear, 2 single entrance doors and 9 additional fixed windows complete the look of this impressive extension. The large windows to the front of the extension open up the views helping to create that all important sense of space. Whilst this design was all about maximising natural light inside, it was important to keep the temperature down inside. Anti-sun grey solar control glazing was used in the front elevation of this extension without affecting the overall look. The anti-sun glass is perfect for this type of construction as it helps to even out the temperature variations throughout the year.